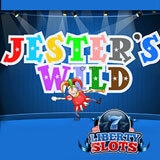 After it paid out over $300K in its first week online, it's no wonder the new Jester’s Wild video slot from WGS has been the most popular game at Liberty Slots Casino this month! It's generous with free spins, and it Spin Up Your Win feature can multiply winning spins up to 5X. You can play one to three coins, betting as little as a penny or up to $5.00 per spin. Win up to 32 free spins with a multiplier up to 6X when three Free Game symbols appear. If you get a Jester symbol on the center wheel, four other symbols will randomly change to Wild. How can you not win with 5 Wilds?! "I can see this game being a favorite for a long time, said casino manager Mark Ramirez. "There are so many different ways to win, it really is a special game." You'll find more than a hundred slot games from Wager Gaming Technology at Liberty Slots. Check the Tournaments tab for daily, weekly and monthly slots tournaments including the $30,000 Giant Thanksgiving Turkey slots tournament that continues until November 30th.